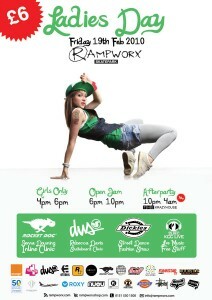 The Ladies Jam in the Rampworx Skatepark is back and bigger and better than ever! If you wanna learn some new moves or get on a deck at all, make sure you check by the RAMPWORX SKATE PARK in Liverpool, Netherton, 1-3 Leckwith Road on February 19th to get yourself some tips from pro skater Rebecca Davies! Start will be ladies session from 4:00-6pm, followed by an open jam from 6pm-10pm. And of course there will also be an afterparty at the Krazy House from 10pm for all those who still didn’t get rid of all their energy. Hmmm . . . who remembers last years event?! When did Becky “go pro”? Haha i know i was ill at last years…but it was still a bit iffy! If they do a girls only session for a bit like they said, then it will improve upon last years. They definitly need to do a lot of improving on last years event; think i’ve been put off for good! Probably going to shine this. Everything was wrong about it from the seriously mis-informed flyer to the lack of insight about hosting a Ladies Day on the busiest day at the skatepark without even having a ladies only session. The park was rammed with guys, mostly on bmxs! The girls who had turned up to give skateboard ago were too intimidated to skate. The MC was a moron, who was completely detached from the skateboard scene and he sleezed all over people at the after party (poor Helena!). People were awarded product for answering such question as whats 1+1 rather than being encouraged to land a trick or something. I was the lucky recipient of a the “prize” of any Element hardware I might want to purchase for half-price! Urgh! I could go on! Its cool that people want to promote girls skateboarding, but when it is events organisations that don’t know anything about skateboarding and don’t consult skateboarders then the results are invariably poor and can impact negatively on consequent attempts to organise girls skateboarding activities. eeek! well.. I won’t be able to make it as its too far to be traveling so close to the Ladies Monthly event you and Sam are organizing, but I hope it turns out a bit better than the last event! Did anyone email the event organizers to let them know what went wrong with it? Hahh…. I love the rants here about what happened last year at Ladies Day and what could possibly happen this year. A some of you are right about things that didn’t go to plan which i had organized but what did go to plan was the fact that we were successful in having 400 girls turn up to an event that was promoted towards them to skate, bmx and inline and have fun. Ladies Day was not wholly for skateboarders. It was to promote the awareness of girls participation in sport: Inline, skateboarding, street dance, football and surfing. Rebecca Davis is not a pro but she is going to teach girls with DVS shoes as she put who self forward to do so, no one said she was a Pro. So that is completely wrong. She just building her way to becoming a Pro and she will probably get their soon, as humble as she is to part with some time to teach 10-15 year olds girls who have never touched a board or even been in a skate park. We expect this year to be 600 girls which is going to be the only girls event in the UK that has as many girls at one event – reason why we are successful in this event becuase the girls that come want to express themselves not similar to Lois. The average age we had was 10-15- so i can understand Lois’s rant but being the organiser of this event and trying my best to get girls to participate in a male dominate domain – I am glad the event exists and now in its second year – with Ryan Air, Rocket Dog and Rock Star Games sponsoring we must be doing something right to get them attached to this girls-movement. But you must just take note that its not a skate board event – all sports, street dance, skate boarding, inline, bmx and awareness. The MC was being creative in 09 because some girls had never been on a boards before so the more creative to give things away is better i think we made sure every girl received an item or goodie bag. 1+1 was his way of having fun. I don’t consult any girl pros or girl like Lois because they dont understand the event premise: its all about grass roots. I consult with a steering group of 20 girls age 10-15 on what they want at an extreme sports event they want boys , they want music , free goodies, no pros skater, inline, or bmxer because they not sure whos is who in the country and they want to be taught. Every other girls event i have been to up and down the country has not enlighten me one bit. No interaction, everyone looks smoked out, and cliques everywhere when it should not be intimating but more about celebrating and engaging the sport. You can never please anyone – but at least i pleased those that asked for us to do it again this year. To those who cant make, it is a shame but sometimes in life experiences are best dealt with personally once you tried something you will know if it was good for you or not, rather than relying on other peoples gospel. hahaha! wat a nob! I think he made my point for me! At 10-15 and they want boys? Fu’king ramp tramps! I think it’s great that there was a turnover of 400 girls at the event, all being encouraged to trying out new sports. But to gain back the respect and the support of the girls who didn’t think it went to plan last year, personally attacking them isn’t the way to go about it. Not consulting “any girl pros or girls like Lois because: they dont understand the event premise” is also mistaken. These are exactly the people who need to be contacted as these girls started off as beginners too, and kept with it. So speaking to these people is crucial if you want to organise a successful event, and by successful I don’t just mean numbers; I mean finding the best way to actively encourage the girls who do turn up, to try one of the sports on offer and making such an environment that they’d want to keep on at it. Jason…shows that you listened to some of the feedback from Pro’s like Lois because this year you are providing a girls only 2 hour session. If you want Grass Roots, check out ‘As if, And What? !” Skaters featured include Lois, Helena Long, Sam Bruce as well as some more of the underground (but soon to blow up) skaters such as Emily Russell, Zeta Rush, Danielle Mellor. This is Grass Rotts and this is higher profile skater and underground skater working in harmony. Seems to me your making it ‘them and us’. Jason, how many girls event have you been to?! I have been to every other girls event in this country since 2003 and I have never been ‘smoked out’ in my life! Have you watched the Mega Mission tour video…or the Girls Skate Jam Uk 09 clip?! Evidence to make you eat your words with regards to interaction, cliques and an intimidating atmosphere! Oh dear…i can’t be bothered at the moment to write any more in response to you Jason. If theres 400 girls there how is there any space for boys? Surely the day is not meant for eyeing up guys, it’s to show the girls some female role models, whether they are well known or not. I think it should be strictly girls only for the whole day or at least a larger amount of time. if, by a success, you mean managing to cram 400 adolescents into a warehouse and throw some wheels in their direction, then yes congratulations, you’ve managed it. but i think it’s pretty easy to gather a negative impression from the comments above… and i agree. i’m not going to like, “diss” your event, jason (even though you just called out every other event yourself), because it’s really not that bad of an idea, it’s just pretty badly executed and a bit awkward if you’re over the age of 12.
i won’t be going to this “ladies day” or the next, but fully intend to go to the next UK girls jam, NASS, Corby, skeg etc. and all i can make in the future, i think that says it ? The level you stoop to…hah. Im no a nob, wish i was then i could be more ruthless im just a trier, like you Lois trying to be good at something. When girls asked for boys, it was for boys to be there to learn tricks from and be around not in the sense of a ramptramp…most of the girls skaters i assumed learnt from boys originally. if im not wrong. Fran…capacity is over 1000…its the biggest skatepark in UK… I am not arguing i am just stating what happens and why this event is appealing…maybe not to any of you here…maybe there is no point it even being promoted here…as it’s not helping here. At Mega Mission i’m keen to know how many girls you had who had never skated before that wanted to learn….and the pros were willing to teach patiently? LA you dont need to write anymore – the event will be done and you can complain all you like…I could never win an argument here im male..and planned an girl event how could i win. Good luck with all that you are working on…Lois wish you luck in all that you, hope you can become a very successful skater girl…who girls will look up to..! Lois is a very successful skater girl and I look up to her …she does a mad stez bs flip in ‘AIAW’. You’re right your male you won’t win here and you won’t win in life. right well first … as far as promoting your own event goes you are no einstein. I think you have just let some ego get in the way of some criticism which could have been used constructively and helped improve the orgsanization of the event. I think you are quite insincere in your intentions of “trying my best to get girls to participate in a male dominate domain” or at least extremely misguided..and thats being kind.. especially if you think that what girls age 10-15 want at an extreme sports eventis… “they want boys , they want music , free goodies” … I think you should maybe have a little more respect for the group of people to whom you are aiming your event at and provide them with the oppurtunity to “express themselves” in a non biased and supportive environment without the “them and us” elitist attitude which you are creating here, because in reality it is exactly the opposite. Every girl who skates in the uk skates together, whether you are pro or not is totally irrelevant. You probably recognize my name – Well im trying to get in contact with you as i would like to speak to you about an event i am putting on this summer with the help of organisers from the californian Supergirl jam – im organizing a uk tour of parks to promote Supergirls. I would like you to be the street skater as your a supergir i want on the tour-serious. jasonm@dynamicmediaevents.co.uk. look forward to hearing from you soon. Forget all that was said here this is business now. if you could please get in touch to let me know if your interested as im compling the list of riders..cheers. I’m sorry, I’m not from England, an other country in Europe, so my english is not the best. I read the comments above and thinked who are you? I know Lois and I know Rebecca, and I know some of the other Girls from different Events all over Europe. But on that way as you and Lois are talking here and as you wished her good luck and: ” that you become a very successful skater girl…who girls will look up to..! ” I knew that you don’t have an Idea who Lois is. She IS allready a successful Skater, but not because she will going to be Pro. She is a successful Skater because she’s doing it aut of fun and not out business. Do you really think, that she want’s work together with you in that businessevent and just forget all that was said here, only because you now maybe got an Idea of who Lois is and need someone who makes all the hard work for you? Hahhahaha well said! Lois FTW!